The VMX S.A.F.E. Series is the ultimate product in the market today for Low Voltage Control which allows a Service Engineer / Electrician to do the job safely with minimum PPE. The S.A.F.E control has a low-voltage compartment which has limited energy 120 Vac signals available. All the control logic is in the isolated Low Voltage compartment along with a three phase 120 Vac test point for the primary voltage sensing and measuring. All keypads, meters, lights, relays and control logic are available in the low-voltage compartment. No need to open the high-voltage compartment to check control logic and status. The 65 kA breaker at 480 Vac and surge device are located inside the side enclosure for safety. S.A.F.E. has a LED live voltage indicator connected to the output of the main breaker. The visual voltage indication would guarantee the breaker is open and no voltage is present before entering the larger Soft Start enclosure. The service engineer or electrician can safely enter the large enclosure knowing that no voltage is present and limited PPE is required. An isolation contactor is standard on all S.A.F.E. units so when the motor is off no voltage will be present on the motor leads. Safe for anyone working on the motor, equipment or soft starter control enclosure. Visual live line indication ensures the safety for all Service engineers and Electricians during lockout / tag out procedures. All S.A.F.E. units come with flanged mount lockable breaker which interlocks with both the side safety breaker box and the main soft start enclosure. 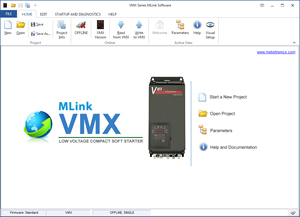 The VMX S.A.F.E. Series also comes with redundant motor protection. 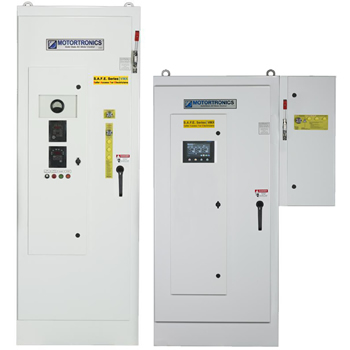 Should the customer need a little extra torque and want to start the motor across the line the contactor and a full digital redundant motor protective relay (Rx Series) is available to protect the motor while performing an across the line start without the Soft Starter. Option NEMA contactors are also available for long life. Both the Soft Start VMX and the Rx relay utilize true thermal modeling to ensure optimal motor protection and performance. When safety, long life and reliability is key and only the best will do --- choose -- S.A.F.E. Series the ultimate protection for Engineers / Electricians and Equipment. 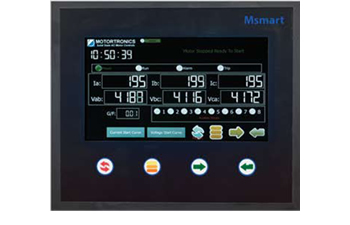 Intelligent Touch Screen Interface offers one interface for Multiple Meters, Relays and Starters..